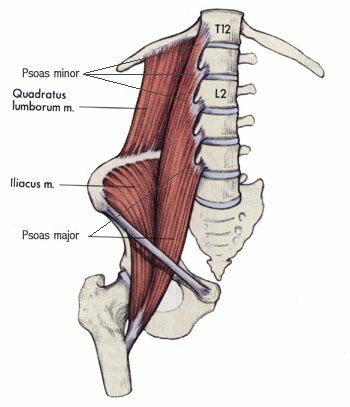 The iliopsoas is actually the nickname given to 2 muscles-- the iliacus and the psoas major. The tendons of these 2 muscles attaches to the same place on the femur (thigh bone), and both muscles have the same action at the hip. The iliacus and the psoas major are often referred to as the hip flexors because their action is flexion of the hip. When the hip bends and your knee or leg moves towards your chest, this motion is known as hip flexion. The Psoas Major originates (starts) on the sides of T12 to L5 vertebrae and the intervertebral discs between them, and it inserts (ends) on the lesser trochanter of the femur. It gets its nerve supply from the ventral rami of lumbar nerves L1, L2, and L3, and performs the actions of flexing the thigh at the hip and stabilizing the hip joint. The Iliacus originates (starts) on the iliac crest, iliac fossa, ala of the sacrum, and the anterior sacroiliac ligaments. It inserts (ends) with the tendon of the psoas major on the body of the femur on the inferior part of the lesser trochanter. The iliacus gets its nerve supply from the Femoral Nerve (L2 and L3), and it performs the actions of hip flexion and stabilizing the hip joint. The hip flexors work with the abdominal muscles during ab exercises. The abdominals work to keep the pelvis and lower back stable, while the hip flexors work to move the legs and keep the hips stable. Here are links to pictures and anatomy descriptions of the 4 abdominal muscles. I've written a more in-depth article on the role of the hip flexors during ab exercises and how the hip flexors might contribute to lower back pain during leg raises and sit ups. 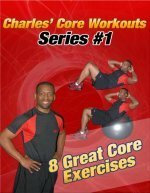 The above article is a must read for anyone who wants to have a better understanding of why some ab exercises may actually irritate lower back problems. It is also important for everyone to include hip flexor/ iliopsoas stretches into their workout routine. I hope all my articles and workout tips help you to reach your fitness goals.